In honor of launch, new tickets available from 17 euros per seat. Tourism Minister: Ryanair is part of our great tourism revolution. Ryanair on Thursday extended its Tel Aviv winter 2017 schedule with a new route to Rome's Fiumicino (Leonardo da Vinci) Airport. Currently, Ryanair offers weekly 8 flights from Tel aviv and 14 flights from Eilat's Ovda Airport. The new weekly schedule will include 28 weekly flights, and is expected to serve 330,000 customers per year. 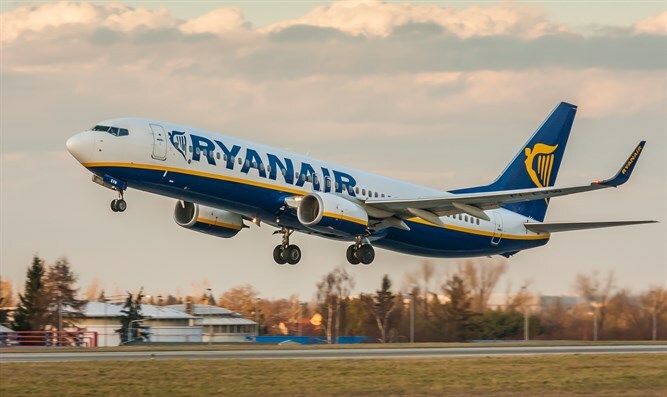 “We are pleased to extend our Tel Aviv winter 2017 schedule, with a new daily route to Rome Fiumicino, in addition to our other new routes to Baden Baden, Gdansk, Krakow, Milan, Paphos, Poznan and Wroclaw," Ryanair Chief Commercial Officer David O’Brien said. "Our 8 Tel Aviv routes, along with 14 Eilat Ovda routes, underline the commitment we have made to boosting Israeli tourism, traffic and jobs and we look forward to continuing to work with Tourism Minister Yariv Levin (Likud) and his team to bring even more new routes to Israel in the coming years. "To celebrate our new Tel Aviv route to Rome, we are releasing seats for sale from just €16.99, which are available for booking until midnight Sunday, July 30th." "I am pleased that the collaboration between the Israel Tourism Ministry and the giant airline company Ryanair has intensified," Tourism Minister Yariv Levin said. "Ryanair - which has identified the upward trend in incoming tourism to Israel – has expressed a great vote of confidence in the Israeli tourism product and is continuing to open new routes into Israel." "The significant entry of Ryanair into Israel is part of the great revolution that we are bringing to the tourism industry. It also serves as testament to the substantial improvement in Israel’s attractiveness as a tourism destination. "This improvement finds its expression in the 28% increase in tourist entries from Italy to Israel, and in the record number of tourists visiting Israel from round the world that we have seen in recent months."